The Expedition 23 crew of the International Space Station poses for a group portrait in April 2010. Russian cosmonaut Oleg Kotov, commander, is at center. Also pictured clockwise (from bottom center) are Russian cosmonaut Alexander Skvortsov, NASA astronauts Tracy Caldwell Dyson and Timothy "T.J." Creamer, Russian cosmonaut Mikhail Kornienko and Japan Aerospace Exploration Agency (JAXA) astronaut Soichi Noguchi, all flight engineers. Thisstory was updated at 8:19 p.m. EDT. ARussian Soyuz spacecraft undocked from the International Space Station lateTuesday and is headed back to Earth with three veteran spaceflyers eager to returnhome after nearly six months in orbit. TheSoyuzTMA-17 spacecraft undocked at 8:04 p.m. EDT (0004 Wednesday GMT) while flying 215 miles above Mongolia to beginits hours-long descent with Russian cosmonaut Oleg Kotov, commander of the station'sExpedition 23 mission, at the controls. "Bye-byestation!" Kotov said as the Soyuz carrying him and two crewmates backedaway, revealing the huge space station ahead. "Beautiful view." Kotovsaid the undocking went extremely smoothly. He is returning to Earth withAmerican astronaut Timothy "T.J." Creamer of NASA and Japaneseastronaut Soichi Noguchi. The three men made up half of the space station'sfull six-personcrew and had lived aboard the orbiting laboratory since mid-December. "Oh!I forgot something. Can we go back?" Creamer joked as the Soyuz movedever-farther away from the station. His crewmates laughed. Duringtheir time on the station, Kotov and his crewmates hosted three visiting NASAspace shuttle missions. Those flights delivered a new NASA room, seven-windowobservation deck, and vital spare parts and supplies. Themost recent shuttle visit by NASA's Atlantis orbiter in May delivered a new$200 million Russian research module called Rassvet (which means"Dawn" in Russian). "It'stime to give up commanding of the station," Kotov said during a change ofcommand ceremony. "It was really a successful mission for us." Lastweek, Creamer said that after more than five months on the spacestation, he's eagerly looking forward to returning to Earth and seeing hisfriends and family again. Andwhile Creamer admitted that he will miss the camaraderie of his crew and theview of Earth from space, there are some creature comforts that cannot berecreated in weightlessness. WithKotov and his crewmates returning to Earth, Skvortsov and his crew will getstarted the station's Expedition 24 mission. 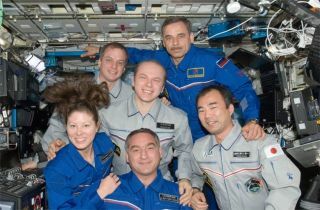 Skvortsovarrived at the space station in early April with fellow Russian cosmonautMikhail Kornienko and American astronaut Tracy Caldwell Dyson of NASA. Thespaceflyers initially joined the Expedition 23 crew and will now remain behindto await the arrival of three new crewmembers slated to launch fromKazakhstan's Baikonur Cosmodrome on June 15. SPACE.comis providing complete landing coverage for Kotov and his Expedition 23 crew. Click here for mission updates and a linkto NASA's undocking and landing webcast.